Eat your way to a better recovery, is there a way? Nutrition is important for survival we require it to be able to function in our daily lives. Sustaining an injury increases the physiological demand of our body to promote tissue repair. It is understood that optimizing nutrition can facilitate and expedite recovery times (reference, reference). As I have progressed through my physiotherapy career I have investigated the need for nutrition to expedite and optimize recovery from injury. I make a point of educating my patients about nutrition for optimal recovery. Here’s my take on the low down on how you can help your healing injury through eating the right foods. Now there is so much advice out there on nutrition, it can be very confusing for us to know what to eat, when to eat and why you should eat it. I personally would not get to caught up in the technicalities of it unless you are an elite athlete. There are plenty of agreements/disagreements out there about when to eat i.e. within 40 minutes post exercise, the use of protein supplements. Let’s give you a quick low down on body make up and tissue repair. Soft tissues consist of collagen, elastin and ground substance surrounded by an extracellular matrix (a scaffold to hold everything together). Soft tissue such as tendons, ligaments, fascia, skin, fibrous tissues, fat, and synovial membranes are classed as connective tissue as they connect, separate or support different parts of the body. Muscle, nerves and blood vessels are separated by connective tissue in order to move and glide within the body. So knowing how are tissues a composed let’s have a closer look at the process of healing in order to understand how we can optimize each phase with appropriate nutrition. 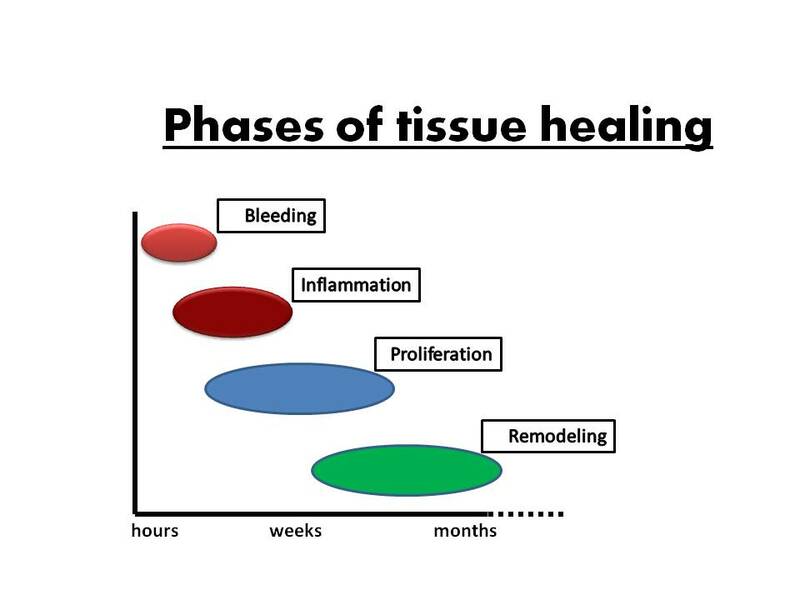 Tissue healing tends to come in 3 phases (if you exclude initial bleeding) an Inflammatory phase, a proliferative phase and a remodelling phase. Depending on the type and severity of the injury will determine the length of time it takes for the injury to heal. Inflammatory phase – The inflammatory response is necessary for proper healing. This stage may last for a few hours up to several days depending on the injury (reference). Chemical mediators, cleaning cells, scaffolding cells and fluid come into the injury site to begin the cleaning and repair process. Often recommendations such as NSAIDs (ibuprofen) are made to decrease or even eliminate the inflammatory response. However, given that inflammation is a critical component of the healing process (reference), elimination of the inflammation may not be ideal for optimal recovery. The processes associated with inflammation are energy requiring thus energy expenditure increases during wound healing. Proliferative phase – The proliferative phase has a crossover period with inflammation. It begins within 24-48 hours but reaches its peak around 2-3 weeks. It is primarily associated with laying down of collagen (building cells slowly replace the scaffolding cells) for scar formation and proliferation of local fibroblasts (reference). Simply put this is new tissue being laid down in a hap-hazard fashion to give the injury strength. Proliferation, as with inflammation, requires energy to promote the processes. Remodelling phase – Remodelling has been shown to begin within the 1st week (reference), and can last up to a year or longer dependent on the tissue state and severity of the injury and also how the tissue has been influenced. Yet remodelling is a continual process. You are constantly remodelling throughout your life. The reparative tissue that was formed by the first 2 phases gets replaced by type I collagen (reference). It is suggested that the tissue is laid down in lines of tension. A quick point I would like to make here that is very relevant to every phase is the process of optimal loading and mechanotherapy (movement progression). Studies have shown the benefits of exercise prescription in optimizing injury management and influencing tissue health (reference). So how do we optimize theses phases with nutrition? We require certain percentages of macro-nutrients (water, carbohydrates, fats and proteins) and micro-nutrients (vitamins and minerals) in our diet during tissue healing. Collagen is being replaced and replenished through protein synthesis and breakdown so it would make sense to increase your protein intake to aid with tissue recovery. Leucine in particular has been shown to enhance protein synthesis (reference). It is found in a variety of food sources including soy beans, beef, eggs and also as a supplement in powder form. Micro-nutrients such as vitamins A and C have been shown to have the most beneficial effect on tissue healing due to their direct interaction with collagen deposition and their effects on inflammation (reference). Foods include fruit and vegetables such as avocado, oranges, bananas, garlic, green beans, broccoli and kale. These also have a high antioxidant content which has an anti-inflammatory effect. Fat intake particularly omega 3 fatty acids and monounsaturated fats are most beneficial to promote tissue healing as they express anti-inflammatory and immuno-modulatory properties. Omega 3 and monounsaturated examples consist of flax seeds, salmon, avocado, sardines and everyone’s favourite the brussel sprout. A diet of processed food, fast food, microwave tv dinners, white bread, pasta etc can be high in carbohydrate and which accumulates visceral fat (the stuff that sits on your organs) have been shown to have a pro-inflammatory effect and they are just not very healthy. There is some difference of opinion around omega 6 fatty acids due to their pro-inflammatory effects. 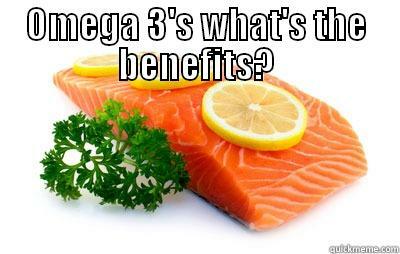 Omega 3 have been shown to have anti-inflammatory properties (reference). So a balance of omega 3 and 6 support inflammation as you need to have inflammation in order to promote healing and collagen deposition. This can be difficult due to omega 6s having a high abundance in food such as cooking oils and corn fed animals that give us our meat products. So it is wise to know the source of your food and how it has been reared. Other micro-nutrients including copper, iron, magnesium and zinc in fruits and vegetables support tissue regeneration and repair as they help to support early inflammation, reverse post-injury immune suppression, assist in collagen formation, strengthen connective tissue, as well as support protein synthesis. Effectively your diet will have an affect throughout all the stages of tissue healing. If you balance it well or increase your intake of macro and micro-nutrients slightly this will help to optimize tissue repair, dependent on the location, severity and duration of the injury. Summing up it is important to make sure that you are not malnourished as this will delay wound healing. Eating processed food that are high in trans-fats and saturated fats will have an adverse affect on tissue repair/wound healing. Dependent on your fitness levels and determination to get back to sport and exercise, increasing intake of certain macro and micro-nutrients and adopting an optimal loading approach will optimize tissue healing and recovery rates. Next Core stability: A circus act! Thanks for the comment and tips! I do spend quite a bit of time reading, so an easy way to access it would be helpful. 1) Eat a wide variety of different coloured fruit and veg during the week. This way, you’ll get lots of antioxidants and different vitamins, which each have different benefits (like vitamin C to help with collagen formation, and vitamin A which is involved in the immune system). Thanks for the additional tips I appreciate it for the benefit of the readers.